Asbarez reports about the Nairit explosion in Yerevan, a plant that Armenians closed due to environmental concerns toward the collapse of the Soviet Union. After the plant reopened in 1992, demands to close it down had died due to economic depressions. Will the new incident reignite the environmental movement? Two explosions within the spam of about five minutes rocked the Nairit chemical plant in southern Yerevan at about 6.40 pm Thursday. The explosions reportedly followed a huge fire at a chloroprene production shop at Nairit, the region’s largest synthetic rubber producing plant. The two explosions could be heard by residents living in the nearby area. Sixteen fire-fighting vehicles reportedly rushed to the scene soon after the incident and were fighting fire late on Thursday. The fire rated as ‘huge’ was reportedly localized. Several ambulance vehicles were rushing into the area. According to unconfirmed reports, there are at least three deaths and over a dozen injuries. According to A1Plus, there are five deaths. Armenia may be the smallest of all ex-Soviet countries, but when it comes to damaging the environment it shows little modesty. 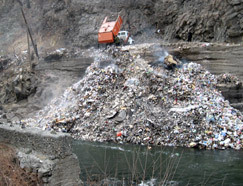 Writing in Armenian, Hetq.am posts a photo of resident and economic trash being dumped into the River Debed in the northern city of Alaverdi. The joint Turkish-German project is something to welcome especially the universal message that the involved volunteers are trying to spread.Yet in promoting environmentalism, Greenpeace, I believe, is also unintentionally violating Armenian cultural rights while not inviting Armenians to be part of a project that involves their sacredMount Ararat. Ironically enough, the Mount is not even called Ararat Turkey (it is called “Agri”).